Haven't your equity funds given handsome returns in the past one year after underperforming for a sizeable period? 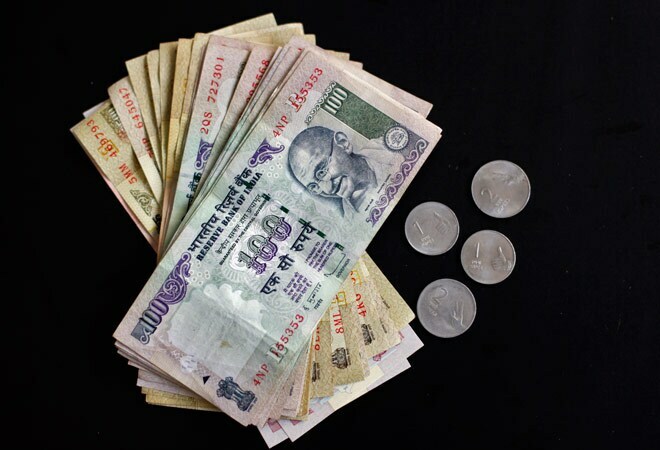 The change in fortunes of these funds can be attributed to the sharp run up in the stock market over the period. But did you invest in UTI Transportation and Logistics Fund, Sundaram SMILE (Small and Medium Indian Leading Equities) Fund, DSP Blackrock Micro Cap Fund or Birla Sun Life Pure Value Fund? If the answer is no, then you may have missed a trick. In terms of market cap, the midcap and small-cap indices returned an astounding 69% and 96% respectively during the bull run from January 2007 to January 2008 leaving behind the BSE Sensex's 46% return. This was mimicked by funds investing in these stocks like the SMILE Fund, which returned 82% during the period. 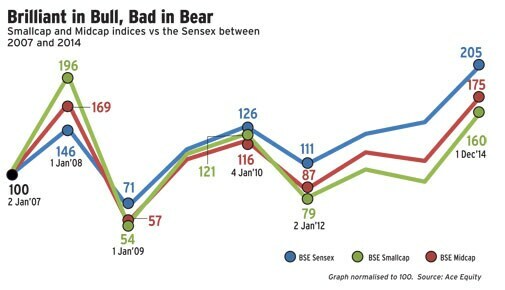 Thereafter, came the market bust (January 2008 to January 2009) and the smallcap and mid-cap indices lead the race to the bottom, losing 66% and 72%, respectively, compared to the Sensex's fall of 51%. 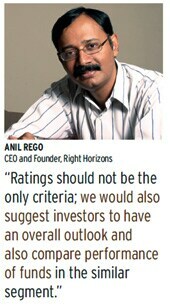 According to Anil Rego, CEO and founder of Right Horizons, small- and mid-cap funds are a 'high-risk high-return' strategy and, hence, during a bull run they tend to do well. However, when the markets are down, mid-caps tend to fall more than large-caps because of their high beta (usually more than one). Since they are less liquid than large-caps, they are inherently more volatile. Sectoral funds have higher risk than mid-cap funds but they could also have periods of extreme outperformance. The infrastructure sector was touted as the star during the bull run of 2006 and 2007 and the Infrastructure Index retained the top slot for about two years owing to a roaring economy and the government's thrust on the sector. Hence, funds based on the infrastructure theme delivered returns of 85% (in 2007) but were also among the biggest losers (their value eroded 56%) when the sector went out of favour in 2008. On the other hand, diversified equity funds didn't make a killing in the bull run but ended up with a limited downside compared to the fall in the Sensex. Further, diversified funds help deliver higher riskadjusted returns in the long term by mitigating risk by spreading across different sectors. According to Raghvendra Nath, MD, Ladderup Wealth Management, it would be improper to come to a conclusion on the basis of a year's performance. Such performance can be due to a few chance allocations to certain stocks or sectors. 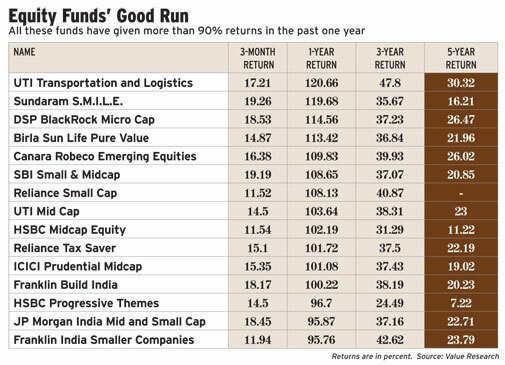 Rego adds that Sundaram SMILE Fund's performance is not consistent with its peers and returns in the short term can be like a flash in the pan. He instead suggests funds with consistent returns. Even though they may offer lower returns in the short-term, they don't get stuck on the down side. Past performance is only one of the indicators for evaluating a fund. "Developed markets deploy many ways to evaluate fund performances. However selective data display and 'cherry picking' can harm investors," says Tushar Pradhan, CIO, HSBC Global Asset Management, India. Comparing a fund's performance against others over a stipulated period can be hazardous. "Risk parameters, expense ratios, fund manager's track record, turnover ratios and many other fund metrics can help provide a much more balanced view. We encourage investors to look at the performance in conjunction with the risks undertaken," says Pradhan. Risk statistics like beta, for instance, will tell you the stock's relation to the general market. A beta of one indicates that the stock will move with the market while a beta of less than one means that the stock will be less volatile than the market. A beta of greater than one indicates that the stock will be more volatile than the market. Research companies like Value Research and Morningstar assign ratings to funds based on certain parameters. However, they may not all be the same. "Ratings should not be the only criteria; investors should also look at the overall outlook and also compare performance of funds in a similar segment," says Rego. The best approach is to take an equal exposure in large-cap and midcap funds. "Large caps give stability to the portfolio and mid-caps provide extra returns in the long term," adds Nath. Once the market has gone up, invest via SIPs which will help generate higher returns by reducing the average purchase cost.